The North Carolina beef cattle industry relies primarily on the use of high-forage diets to develop replacement heifers, maintain the cow herd, and sustain stocker operations. However, forage quantity and quality changes with season and environmental conditions. Depending on the physiological state and animal category, forage-based diets may not always meet 100% of the nutritional requirements, resulting in body weight loss or reduced performance if supplemental nutrients are not provided (Funston et al., 2012). Animals experience nutrient restriction more often than realized because of overgrazing situations and a lack of forage frequently observed throughout the state. There are two typical priorities related to feeding beef cows: (1) provide the cheapest diet possible to reduce annual feeding costs, and (2) provide enough nutrients to prevent reproductive failure. It is well known that poor cow nutrition can decrease reproductive performance. If cows’ nutrient requirements are not met before calving, they will start mobilizing nutrients from their own reserves to survive and to maintain fetal calf growth. Consequently, it is likely that these cows will calve at a low body condition score (BCS). The BCS system is an indicator of the percentage of body fat during cows’ production cycles, and it is a crucial determinant of their reproductive performance and productivity. Cows will not conceive at an acceptable rate (generally >85%) without adequate body fat reserves (BCS = 5; 1 to 9 scale). A low BCS at the time of calving (less than 5) extends the anestrous period, which is the period when the cow is recovering from calving and is not cycling. An extended anestrous period decreases the percentage of cows that are cycling and able to breed at the start of the breeding season, leading to lower pregnancy rates as shown in Figure 1. 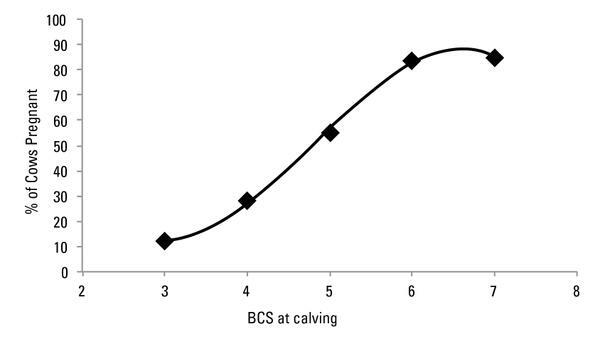 As BCS at calving decreases, pregnancy rates also decrease (Figure 1). In addition, pregnancy will probably occur at the end of the breeding season, delaying the subsequent calving and leaving less time to recover before the next breeding season. Recently, a lot of researchers have demonstrated that cow nutrition can impact more than just pregnancy rates. In this publication, we will summarize some of the recent data showing the effects of poor cow nutrition on calf growth and performance. Figure 1. Pregnancy rates of cows calving at different body condition scores (BCS; Selk et al., 1988; n = 300 multiparous cows). Fetal programming is the concept that a maternal stimulus or insult at a critical period in fetal development has long-term effects on the offspring (Funston et al., 2010). Approximately 75% of calf fetus growth occurs during the last two months of gestation (Robinson et al., 1977). Calf nutrient requirements are therefore relatively low during the first two trimesters of gestation. For that reason, many people believed that cow nutrition could only affect calf growth during the last trimester of gestation. Recent data demonstrate that this is not the case. Maximal placental growth, differentiation, and vascularization occur during the early phase of fetal development. The placenta is the major regulator of calf fetal growth, and it appears that maternal nutrition may affect the development and function of the placenta (Funston et al., 2010). In addition, the majority of calf organs form simultaneously with placental development during early gestation. For instance, heartbeat is apparent as early as 21 days of pregnancy, whereas pancreas, liver, adrenals, lungs, thyroid, spleen, brain, thymus, and kidneys start to develop at 25 days of pregnancy (Hubbert et al., 1972). Each organ and tissue has its own “window” of formation. For example, organs such as kidneys and pancreas occur during early gestation, whereas muscle and adipose tissue formation occurs primarily during mid to late gestation (Du et al., 2010). Thus, nutrient restriction during gestation might impact placental formation and calf organ development. Also, depending on when the nutrient restriction happens during gestation, the outcome of this insult might have different consequences to calf performance. We will report how cow nutrient restriction during early, mid, and late gestation might differently affect the subsequent calf performance. Cows must conceive within 80 days postpartum if a yearly calving interval is desired. Cows’ milk production and nutrient requirements peak at 60 days postpartum; however, intake lags behind. This results in negative energy balance during early to mid lactation (NRC, 1996), especially if cows are managed to calf during the dry or winter seasons when poor forage quality and loss forage mass is available. Thus, nutrition inadequacy often occurs in beef cattle production systems (Caton and Hess, 2010). Unfortunately, a limited amount of published results exists regarding the effects of cow nutrient restriction during early gestation on beef calf performance. A University of Wyoming study attempted to evaluate the growth performance and organ development of calves born to cows experiencing nutrient restriction during (Long et al., 2010). In that study, cows were separated into two groups that were fed at 55 or 100% of their nutrient requirements for the first 83 days of gestation. Following 83 days, both groups were provided 100% of their nutrient requirements until calving. Understandably, cows provided 55% of their nutrient requirements lost 137 lb of body weight, whereas cows fed 100% of their nutrient requirements gained 95 lb of body weight during the first 83 days of gestation. No differences were observed on calf birth weight, weaning weights, and average daily gain from birth to weaning or during the feedlot finishing phase (Table 1). 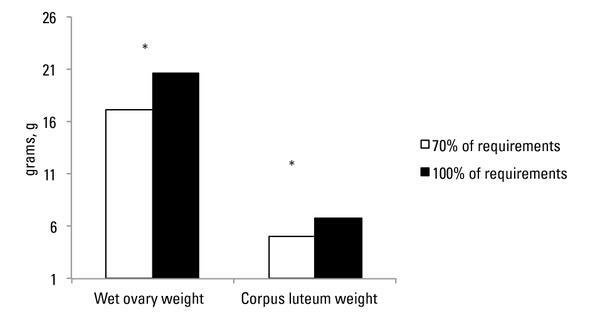 However, lung and trachea weights of steers born to heifers provided 55% of their nutrient requirements were significantly less (P < 0.05) than steers born to heifers fed 100% of their nutrient requirements (Figure 2). Although growth performance was not affected, it would be misleading to interpret these results as if nutrient restriction during early gestation does not impact calf performance. In a commercial feedlot, calves are constantly exposed to several pathogens and commingled with calves of unknown health background. It is therefore possible that smaller lungs could be detrimental to calf performance if those calves experience bovine respiratory disease after entering a commercial feedlot. However, additional studies are needed to confirm this hypothesis. Table 1. Growth performance of male offspring born to first-calf heifers fed 55 or 100% of their nutrient requirements during the first 83 days of gestation (Long et al., 2010). Production-oriented tissues, such as muscle, appear to be responsive to fetal programming effects in utero (Caton and Hess, 2010). Muscle formation is divided into two waves of muscle fiber synthesis. The first wave begins at mid gestation, whereas the second wave occurs from six to nine months of gestation (Du et al., 2010). Thus, nutrient restriction during mid gestation is expected to decrease muscle fiber formation, leading to lower birth and weaning weights. At the University of Wyoming, researchers evaluated the growth performance of steers born to cows grazed on low-quality, native pastures (6% crude protein) or high-quality, fertilized and irrigated pastures (11% crude protein) for 60 days from 120 to 150 days through 180 to 210 days of gestation (Underwood et al., 2010). In that study, researchers reported that body weight at weaning and carcass weights were reduced for male offspring born to cows grazed on native pastures compared to male offspring born to cows grazed on improved pastures during mid gestation (Table 2). In addition, the Warner-Bratzler shear force, which is an indicator of meat tenderness, was less for Longissimus muscle samples of male offspring born to cows grazed on improved pastures (31 vs. 37 N; P = 0.004). In other words, cows that grazed on improved pastures during mid gestation produced calves that were heavier at weaning and harvesting, and that had greater meat tenderness at slaughter. Nutrient restriction during mid gestation also may have consequences on organ development. Angus × Gelbvieh cows were randomly allotted into groups and fed at 70 or 100% of their nutrient requirements from day 45 to 185 of gestation. They were then commingled and fed at 100% of their nutrient requirements from day 185 of gestation until calving (Long et al., 2012). Although body weight at birth and at weaning did not differ (P ≥ 0.19) between treatments, heifers born to cows fed at 70% of their nutrient requirements had smaller ovaries and luteal tissue (Figure 3). Luteal tissue is crucial for progesterone synthesis and pregnancy maintenance. Therefore, smaller ovary and luteal tissue could affect cows’ reproductive performance during their first breeding season. Additional studies are required in this area to confirm these results and evaluate long-term effects of nutrient restriction during mid gestation on subsequent reproductive performance of the heifer progeny. Table 2. Growth performance of male offspring born to cows grazed on native (6% crude protein) or improved pastures (11% crude protein) for 60 days during mid gestation (Underwood et al., 2010). Late gestation is probably the most important gestation period in terms of potential impact on production-oriented tissues such as muscle and adipose tissue. As mentioned before, major portions of beef cattle muscle and adipose tissue form during late gestation (Du et al., 2010). Muscle fiber number is set at birth, meaning that after the calf is born, there is no net increase in the number of existing muscle fibers. Thus, if nutrient restriction during late gestation reduces muscle fiber number (Zhu et al., 2004), calf growth performance following birth might be compromised. In addition, maternal nutrient restriction may also compromise adipocyte populations (cells responsible for accumulating fatty acids and generating intramuscular fat, for example), resulting in carcasses with lower quality and marbling scores. In a series of studies from University of Nebraska (Stalker et al., 2006, 2007; Larson et al., 2009), researchers evaluated the effects of providing protein supplementation during late gestation on subsequent offspring performance (Table 3). Cows were sorted into groups that received or did not receive 1 lb/day of a protein supplement (42% crude protein) during late gestation. All studies reported that male offspring born to cows that received the protein supplement were heavier than male offspring born to non-supplemented cows. In addition, two of those three studies (Stalker et al., 2007; Larson et al., 2009) reported heavier carcasses for males born to cows that were supplemented with protein, whereas one study (Larson et al., 2009) reported greater percentages of carcasses grading Choice and greater marbling scores for steers derived from cows that were supplemented with protein during late gestation. Table 3. Growth performance and carcass quality of male offspring born to cows that received (Supp.) or did not receive (No Supp.) protein supplementation (1 lb daily of a 42% crude protein supplement) during late gestation (*P < 0.05). No Supp. Supp. No Supp. Supp. No Supp. Supp. Similar studies from University of Nebraska also evaluated the effects of supplementing beef cows with 1 lb/day of a protein supplement during late gestation (Table 4). In those studies, weaning weights (Martin et al., 2007) and weights adjusted for 205 days of age (Funston et al., 2010) were greater for heifers born to cows that received protein supplementation during late gestation. In addition, heifers born to cows that were supplemented achieved puberty at younger ages (Funston et al., 2010) and had greater pregnancy rates (Martin et al., 2007) than heifers born to cows that did not receive protein supplementation (Table 4). Table 4. Growth and reproductive performance of heifers born to cows that received (Supp.) or did not receive (No Supp.) protein supplementation (1 lb daily of a 42% crude protein supplement) during late gestation (*P < 0.05). No Supp. Supp. No Supp. Supp. Figure 2. Lung plus trachea weights of steers born to first-calf heifers provided 55 or 100% of their nutrient requirements during the first 83 days of gestation (n = 10 steers per treatment; *P < 0.05). Figure 3. Wet ovary and luteal tissue weights of heifers born to cows provided 70 or 100% of their nutrient requirements from 45 to 185 days of gestation (Long et al., 2012; n = 4 heifers per treatment; 13 months of age; *P < 0.05). Nutrient deficiency often occurs in animals provided forage-based diets due to seasonal variation in forage quality and quantity, and as a result of mismanagement leading to overgrazed pastures. This nutrient deficiency has been shown to impact the reproductive performance of cows, the subsequent growth and reproductive performance of calves, and meat quality. Hence, closer attention and proper nutrition of the herd need to be enforced in order to avoid or alleviate the negative impacts of nutrient restriction during gestation on cow and calf performance. Furthermore, this publication focused solely on the effects of gestational nutrient restriction. It is important to realize that excessive nutrient consumption (energy, protein, minerals, vitamins, and fatty acids), diet composition (starch concentration), energy and protein sources, and stress also have potential for programming calf development in utero. In conclusion, cow-calf nutrition termed “fetal programming” has large implications for the beef industry and merits producer attention and further research attention in the future. Caton, J. S., and B. W. Hess. 2010. Maternal Plane of Nutrition: Impacts on Fetal Outcomes and Postnatal Offspring Responses. In Proc. Graz. Lives. Nut. Conf., 104-119. Casper, WY. Du, M., J. Tong, J. Zhao, K. R. Underwood, M. Zhu, S. P. Ford and P. W. Nathanielsz. 2010. Fetal Programming of Skeletal Muscle Development in Ruminant Animals. J. Anim. Sci. 88:E51-E60. Funston, R. N., D. M. Larson, and K. A. Vonnahme. 2010. Effects of Maternal Nutrition on Conceptus Growth and Offspring Performance: Implication for Beef Cattle Production. J. Anim. Sci. 88:E205-E215. Funston, R. N., A. F. Summers, and A. J. Roberts. 2012. Implications of Nutritional Management for Beef Cow-Calf Systems. J. Anim. Sci. 90:2301-2307. Larson, D. M., J. L. Martin, D. C. Adams, and R. N. Funston. 2009. Winter Grazing System and Supplementation during late Gestation Influence Performance of Beef Cows and Steer Progeny. J. Anim. Sci. 87:1147–1155. Long, N. M., M. J. Prado-Cooper, C. R. Krehbiel, U. DeSilva, and R. P. Wettemann. 2010. Effects of Nutrient Restriction of Bovine Dams during Early Gestation on Postnatal Growth, Carcass and Organ Compositions, and Gene Expression in Adipose Tissue and Muscle. J. Anim. Sci. 88:3251–3261. Long, N. M., C. B. Tousley, K. R. Underwood, S. I. Paisley, W. J. Means, B. W. Hess, M. Du and S. P. Ford. 2012. Effects of Early- to Mid-Gestational Undernutrition with or without Protein Supplementation on Offspring Growth, Carcass Characteristics, and Adipocyte Size in Beef Cattle. J. Anim. Sci. 90:197-206. Martin, J. L., K. A. Vonnahme, D. C. Adams, G. P. Lardy, and R. N. Funston. 2007. Effects of Dam Nutrition on Growth and Reproductive Performance of Heifer Calves. J. Anim. Sci. 85:841–847. NRC. 1996. Nutrient Requirements of Beef Cattle. 7th rev. ed. Washington, DC: Natl. Acad. Press. Hubbert, W. T., O. H. V. Stalheim, and G. D. Booth. 1972. Changes in Organ Weights and Fluid Volumes during Growth of the Bovine Fetus. Growth 36:217-233. Robinson, J. J., I. McDonald, C. Fraser, and I. McHattie. 1977. Studies on Reproduction in Prolific Ewes. I. Growth of the Products of Conception. J. Agric. Camb. 88:539-552. Selk, G. E., R. P. Wettemann, K. S. Lusby, J. W. Oltjen, S. L. Mobley, R. J. Rasby and J. C. Garmendia. 1988. Relationships among Weight Change, Body Condition and Reproductive Performance of Range Beef Cows. J. Anim. Sci. 66:3153-3159. Stalker, L. A., D. C. Adams, T. J. Klopfenstein, D. M. Feuz, and R. N. Funston. 2006. Effects of Pre- and Postpartum Nutrition on Reproduction in Spring Calving Cows and Calf Feedlot Performance. J. Anim. Sci. 84:2582–2589. Stalker, L. A., L. A. Ciminski, D. C. Adams, T. J. Klopfenstein, and R. T. Clark. 2007. Effects of Weaning Date and Prepartum Protein Supplementation on Cow Performance and Calf Growth. Rangeland Ecol. Manage. 60:578–587. Underwood, K. R., J. F. Tong, P. L. Price, A. J. Roberts, E. E. Grings, B. W. Hess, W. J. Means, and M. Du. 2010. Nutrition during Mid to Late Gestation affects Growth, Adipose Tissue Deposition, and Tenderness in Cross-bred Beef Steers. Meat Sci. 86:588–593. Zhu, M. J., S. P. Ford, P. W. Nathanielsz, and M. Du. 2004. Effect of Maternal Nutrient Restriction in Sheep on the Development of Fetal Skeletal Muscle. Biol. Reprod. 71:1968–1973.